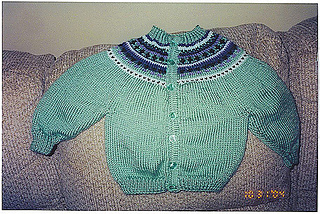 This small-scale cardigan offers an easy intro to Fair Isle knitting. The body is stitched in one piece in Cleckheaton “Country 8 Ply” from Plymouth Yarn. 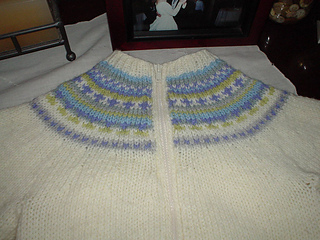 Tiny ribbing trims the sleeves and neck; stockinette-stitch hems edge to front. Five sizes: from 6 months to 4 years.